The products are picked within 24 hours of receiving your order. An order confirmation will be sent to you by email once your order is placed. In addition, a shipping confirmation will be emailed to you as soon as your order has shipped which includes tracking information. Sales tax (VAT 24%) will be charged on orders shipped to EU countries and to Norway, no other tax or import duty will be applied (except in Norway where local charges may occur). If you are a customer outside the EU (European Union) you are not subjected to Finnish VAT (value added tax). 24% VAT will automatically be deducted when you choose your country at the payment checkout. Please note that local charges (customs duty, sales tax) can occur, depending on your region and local customs duties. These charges are at your own expense. Free Postnord parcal post delivery for orders above 200€. For orders below we charge 7€. Free DHL Express delivery for orders above 350€. For orders below, we charge 15€. 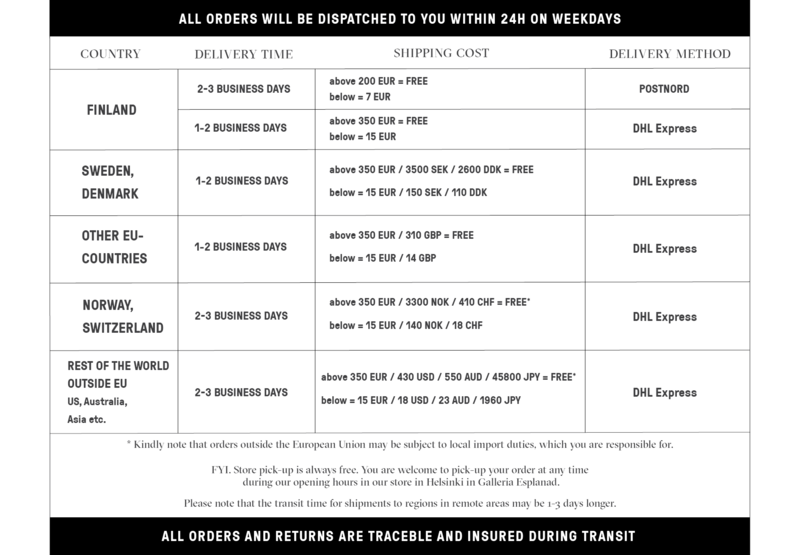 Free DHL Express delivery to all countries (within EU and outside EU) for orders above 350€ / 310£ / 420$. For orders below, we charge 15€ /13£ / 18$. We cooperate with Swedish Postal Service (Post Nord) for the delivery of your order due to their fast and safe deliveries. If your order is a small package it will come directly in your mailbox, anything slightly bigger will be delivered to the nearest delivery point. If you choose DHL Express, your parcel will be delivered directly to your door between 8 am and 6 pm Monday to Friday and require a signature upon delivery. You can specify an alternative daytime delivery address when ordering, for example your work address. All prices include tax and custom fees. All orders are shipped with DHL Express and require a signature upon delivery. It is important that you fill out your phone number; otherwise DHL will not be able to reach you. You can specify an alternative daytime delivery address when ordering, for example your work address. All prices include tax and custom fees. All orders are shipped with DHL Express and require a signature upon delivery. It is important that you fill out your phone number; otherwise DHL will not be able to reach you. You can specify an alternative daytime delivery address when ordering, for example your work address. Kindly note that orders outside the European Union may be subject to local import duties, which you are responsible for. DELIVERY TO REST OF THE WORLD - US, AUSTRALIA, ASIA ETC. International orders to destinations outside European Union are shipped with DHL Express and require a signature upon delivery. It is important that you fill out your phone number; otherwise DHL will not be able to reach you. You can specify an alternative daytime delivery address when ordering, for example your work address. Kindly note that orders outside the European Union may be subject to local import duties, which you are responsible for. All orders are traceable and insured during time in transit until delivered to you at which point responsibility for the shipment passes to you.